Settoon Towing, an inland marine transportation company with offices in Houma, LA and Houston, TX, has been managing boats and barges since 1968. Their planning efforts have always been docked in one office, on a whiteboard, with magnets representing 80 boats and 140 barges. 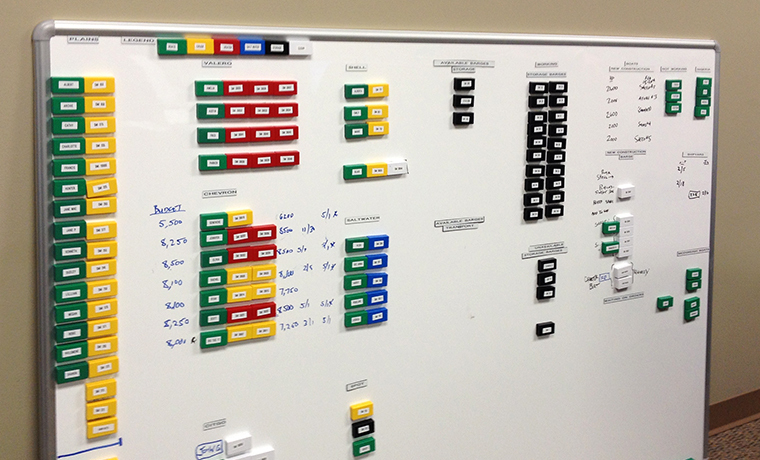 In order to get a meeting in, everyone had to be physically present and move the magnets by hand to plan out the future barge and boat scenarios—planning for the months ahead. With employees in different parts of Louisiana and some out of state, this was difficult to achieve and could cause quite a hassle. These business pains led Settoon Towing to Envoc to help find their bearings and create a more efficient and technical way to handle their boat and barge planning. 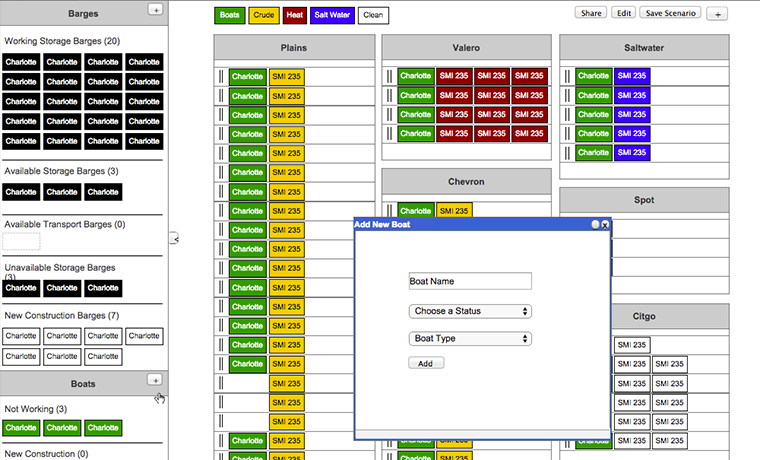 Seeing as Settoon Towing would be organizing and planning multiple boats and barges at the same time, user experience was extremely important. We wanted to make sure that the application could be used and understood by anyone in the meeting or working with the application at their desktop or on their mobile tablet. After this, we knew we needed to implement ways to keep the entire custom-developed web application organized and color-coded by boat type and cargo type. 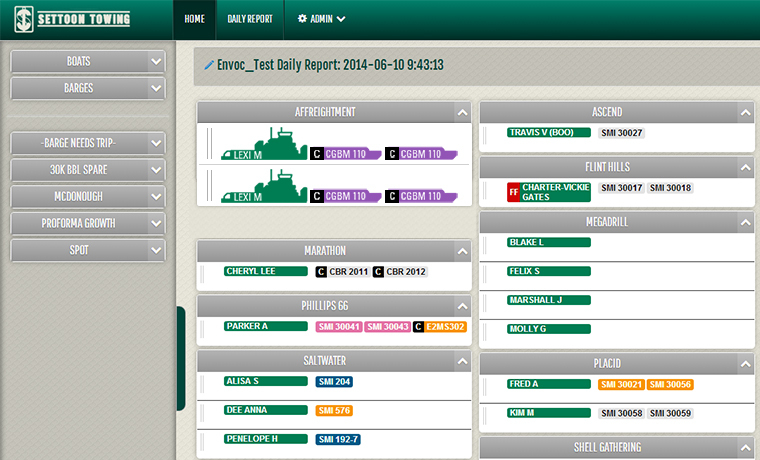 The application needed to provide a way to find detailed boat and cargo information with ease from one screen. Finally, we wanted to make sure the application was pleasant to the eyes with superior graphic design. 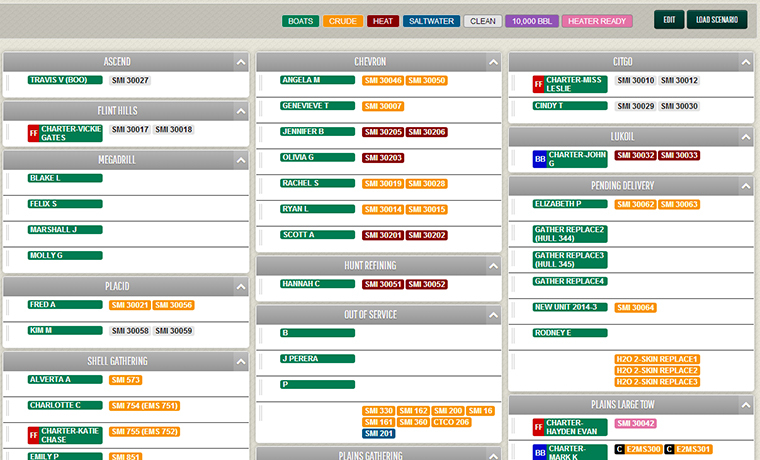 We created a custom web application called FleetPoint that makes the planning process extremely easy. To make sure it was user friendly and easy to navigate, the application was developed as a single page using AngularJS. 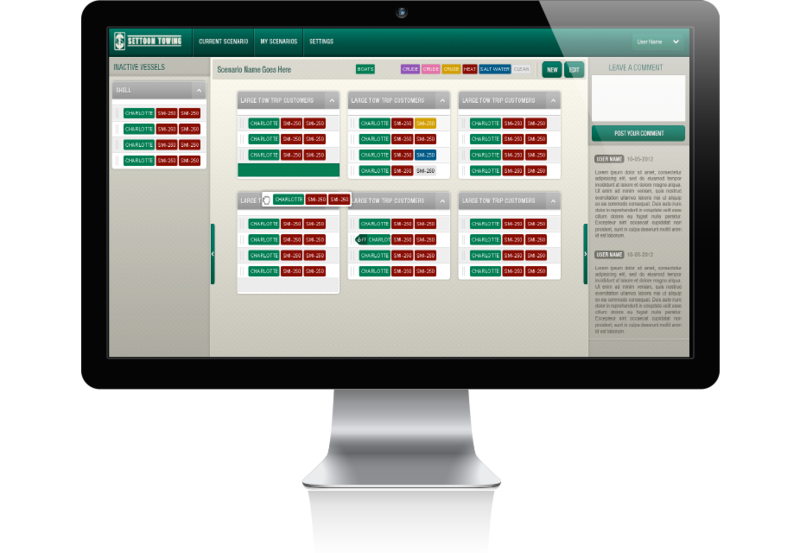 The application is drag-and-drop enhanced, allowing the meeting planner to move barge symbols around with ease. Each barge item is color-coded, allowing everyone attending the meeting to easily distinguish boats and cargo from one another. We needed to make sure that detailed information was readily available, so we made that information show when you hover over the boat or cargo. After this, we added the final graphic design touches, making application look beautiful while working beautifully.